A few weeks ago, the Saudi founder and Chairman of the media giant Middle East Broadcasting Center (MBC), Waleed Al-Ibrahim, announced the appointment of Nabil Al-Khatib as the new General Manager of the Dubai-based Al-Arabiya and Al-Hadath transnational news channels. Al-Ibrahim, a multi-millionaire businessman who affirmed his confidence in Khatib’s ability to push the news network to ‘new heights’ has himself experienced an unprecedented career low in the past year. Arrested and detained at the Riyadh Ritz-Carlton in November 2017 as part of Crown Prince Mohammed Bin Salman’s alleged anti-corruption drive, Al-Ibrahim was never charged but was nevertheless persuaded to hand over 60 percent of MBC’s holdings to the Saudi government last January. Saudi state control over the network leaves little room for dissenting views in its channels’ presentation of the news. In fairness, the editorial slant of Al-Arabiya since its launch in 2003, and of its sister channel Al-Hadath since 2012 has always favoured Saudi foreign policy in the region. And, while their styles are more muted than that of rival broadcasting giant Al-Jazeera Arabic, the Saudi authorities clearly hope the channels can accrue for the Kingdom the same sort of soft power that Al-Jazeera had previously brought to Qatar. That said, the age of pan-Arab media may well be drawing to a close. Pre-2010, Al-Jazeera Arabic, (trailed by Al-Arabiya), commanded audiences estimated at over 50 million across the Middle East. The channel’s willingness to broach thorny issues and to host figures with deeply diverging opinions encouraged views that al-Jazeera, along with other pan-Arab satellite news channels could serve as an interactive Habermasian Arab public sphere. Viewers across the region, it was optimistically posited, could weigh in on political issues in states where individual agency was otherwise limited. Post 2010, Qatari and Saudi intervention into the domestic affairs of countries affected by the Arab uprisings perhaps inevitably resulted in Al-Jazeera and Al-Arabiya adopting more manifestly partisan positions. Their coverage of the conflicts in Egypt, Bahrain, Iraq, Syria and Yemen has made a mockery of claims to objectivity. And the credibility of both channels further slipped following the Saudi-led blockade of Qatar in mid-2017. Qatar’s outright rejection of Saudi demands for the closure of Al-Jazeera was followed by each channel dedicating considerable airtime to attacking the visions of political Islam (Muslim Brotherhood vs Wahabbist) projected by the other’s financial patrons. Meanwhile, more transnational Arab news channels have joined the fray. In 2012, a group of ex-Al-Jazeera employees, disgruntled by the channel’s editorial slant on the Syrian conflict, broke away to launch the Al-Mayadeen channel in Beirut. Adopting the slogan ‘Reality as it is’ in lieu of Al-Jazeera’s ‘the Opinion and the Other Opinion’ and Al-Arabiya’s ‘Know More’, Al-Mayadeen asserted its goal of providing objective journalism. Al-Mayadeen has never officially revealed its funding sources, but is mooted to be backed by Iranian money and takes a clearly pro-Iranian, pro-Hezbollah stance. Also in 2012, a joint venture between Rupert Murdoch’s Sky News and Abu Dhabi Shaikh Mansour’s Media Investment Company led to the launch of Sky News Arabia in Abu Dhabi. In 2015, the Qatari Fadaat media company launched the broadly secular Al-Araby TV in London under Azmi Bishara’s direction, in an apparent bid to balance Al-Jazeera’s demonstrated sympathies for the Muslim Brotherhood. But in 2015, a bid by Saudi Prince Al-Waleed Bin Talal to launch a pan-Arab station in Bahrain met with spectacular failure. Al-Arab, headed by Saudi journalist Jamal Khashoggi, was shut down the first day of broadcasting after featuring an interview with a Shia oppositionist who criticised the Bahraini government’s revocation of 72 Bahrainis’ citizenship, suggesting that even royal patronage is insufficient cover for criticising an authoritarian host government. Despite increased provision of transnational satellite news, the fracturing of Arab public opinion along geopolitical and sectarian lines over the past eight years appears to have lessened demand. Al-Jazeera, while still broadly accepted as the most popular Arab news channel, has probably less than half the number of regional viewers it had in 2000. The fact that it is now banned from operating in a number of Arab states has not helped. At the Dubai media forum in 2014, Al-Ibrahim noted, ‘Today, the idea of pan-Arabism is decreasing…‘ and suggested that MBC should focus on launching channels at the national level in various Arab states. It would be premature to write off Al-Jazeera or regional competitors just yet. 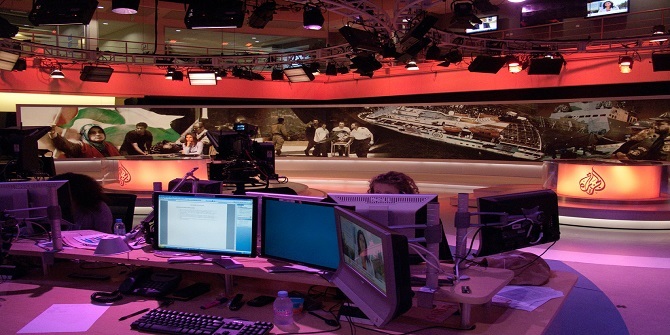 Al-Jazeera’s readiness to adapt to appeal to younger viewers, for instance by promoting interactive hybrid digital models appears to be paying dividends; AJ+ in particular, which produces videos for direct release on social media platforms has proven immensely popular and, unlike the traditional pan-Arab news channels, promises to generate profits. And Qatar’s Al-Araby TV has also enjoyed success with the Jo Show, a political satire series which provides a refreshing contrast to blunter forms of propaganda. At the same time, while competing channels have been losing audiences, viewership of BBC Arabic TV has grown over the past five years to an estimated 37 million globally. Staff members attribute this to their accurate and impartial coverage of regional events (Author interviews, Beirut & London, 2018). This suggests that Arab publics are still attracted to transnational Arab news, even if the ideological pan-Arabism underpinnings have dissolved. Nevertheless, widespread disillusionment with established Arab satellite news channels has generated a diversification in media consumption patterns. By all accounts, Arab audiences have become savvier and more selective in their viewing habits, seeking to verify information from a range of sources. Social media has obviously played a large part in this trend, although the optimism of a decade ago about the emancipatory potential of forums including Twitter and Facebook has dissipated in light of increased governmental surveillance of the web and indications that social media is manipulated by regimes to disseminate fake news. …widespread disillusionment with established Arab satellite news channels has generated a diversification in media consumption patterns. By all accounts, Arab audiences have become savvier and more selective in their viewing habits, seeking to verify information from a range of sources. Adding to this broadly depressing synopsis of the pan-Arab media scene, national and local media outlets have long been dominated by partisan sponsorship, and during recent conflicts, their rhetoric has often proved incendiary, feeding into sectarian violence. Of course, political perspectives are part and parcel of journalism, but a proliferation of small civically-minded independent media ventures across the region over the past decade led by veteran ex-employees of media giants and younger activists represents a push to resist stranglehold of political elites over Middle East media. Like more established networks, the entrepreneurs behind these initiatives are embracing the digital age, and have succeeded in mobilising on single issues. But when it comes to sustained news production, they are swimming against the tide. On a recent trip to Beirut, where online initiatives such as The Beirut Report have flourished, I spoke with journalists and NGOs involved in promoting such ventures. Training journalists in ethical professionalism is still a major concern of intervening agencies in the region, and clearly there are benefits to doing so. But overall the problem is less a lack understanding of how to produce critical and balanced reporting, than an inability to generate the funds to sustain media ventures without vested political sponsorship. With so much free access to news, selling content is no simple task. And while that is a challenge for Western media outlets too, in the conflict environment of the Middle East, the need for commercially viable independent news media is greater than ever. This piece was originally published on the Conflict Research Programme (CRP) blog. This blog gives the views of the author, not the position of the Conflict Research Programme, the London School of Economics and Political Science, or the UK Government. Jessica Watkins is Research Officer at the Middle East Centre, currently working on a DFID-funded project looking at regional drivers of conflict in Iraq and Syria. The project ties in with Jessica’s previous research at the RAND Corporation into Iraqi and regional security issues.